Posted in Soaps & Scrubs. 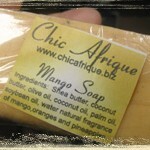 Tagged as acne, aromatic, combination skin, dandruff, eczema, hair, oily skin, scalp, scrapes, seborrhea, skin. 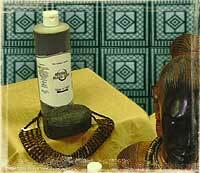 Black soap made from wood ash and palm kernel oil has been used in West Africa for hundreds of years. It is so named for obvious reasons. It is black in color. In its raw form, black soap or Oshe Dudu (Yoruba), Ncha Oji (Ibo) is a mild non-irritation soft soap that produces a rich dense lather. The Shampoo is not very sudy but it will give you the deep cleaning you need. It lifts up dirt and build-up espcecially for those with braids and locs. It is also a very effective facial wash for oily and acned skin. 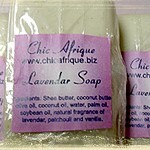 Although research into botanical constituents is still young, forward thinking chemists at Chic Afique Herbals have infused a rich herbal blend that is antiseptic, bactericidal and astringent, into the raw black soap, thus making it highly efficient for conditions such as ulcers, acne, dermatitis and eczema. In so doing, we have taken a good soap from Africa and created an excellent bath and shower system that has increased product efficiency and heightened consumer appeal.